There are a number of locations across London where the juxtaposition of areas where there has been really significant changes with those where there has been almost no change over many decades can be seen. One of the best locations for this is from the top of the hill next to the old Royal Observatory in Greenwich Park. 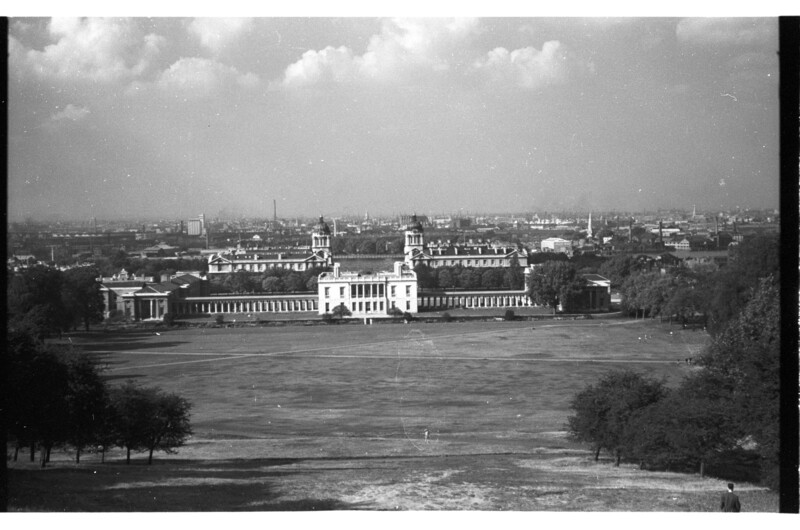 My father took the following photo in 1953 looking out across the Queen’s House and the old Royal Naval College across to the Isle of Dogs. I took the following photo 61 years later in 2014 from the same location. 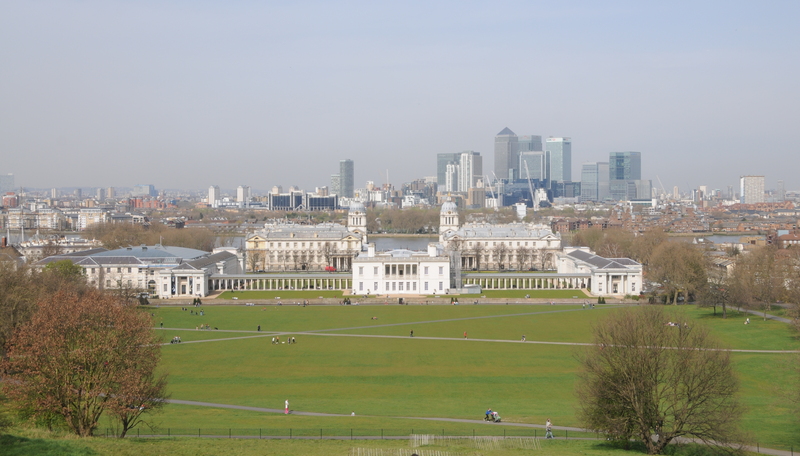 Greenwich Park, the Queen’s House and the buildings of the old Royal Naval College have not changed. Even the paths across the park have stayed in the same position, despite the Equestrian events held on this area during the 2012 Olympics. The view across to the Isle of Dogs is where the changes have been significant. Not just in the buildings that have changed what was a flat landscape into one where tall office blocks fill the horizon, but also in the core function of these areas, employment, traffic on the River Thames and how the landscape of London has changed over the decades. The area just across the River Thames from Greenwich Park is the Isle of Dogs. Here were some of the major docks that during the 19th and much of the 20th centuries were part of the complex of docks along the Thames that made London the busiest port in the world. I took the following photo in the early 1980s. This was just after the docks had closed in the 1970s, but before the significant re-development of the docklands had started. At the time I was flying regularly between London and Amsterdam and always got a window seat as when the approach was over London the views were fantastic. I was always the one glued to the window! This is an evening photo on a route which took the flight in over Essex. across east London to the south of London to Heathrow. 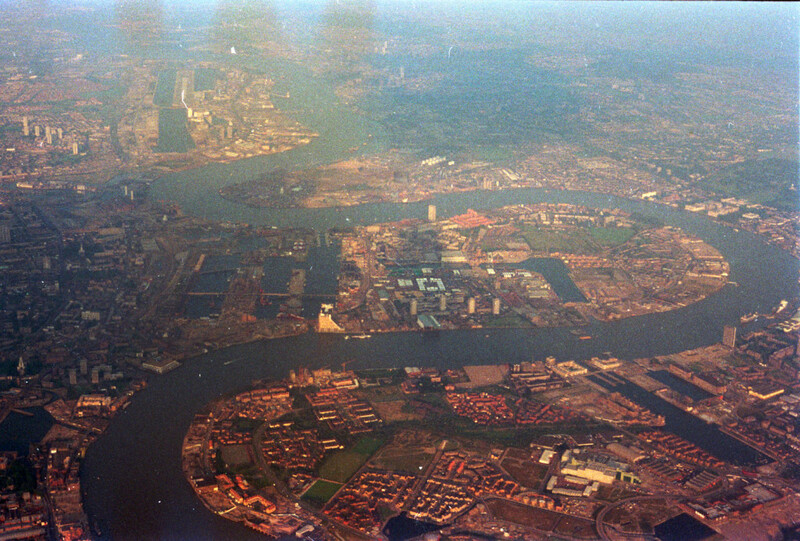 The Isle of Dogs is in the centre of the photo. The loop of the Thames (if I remember Geography from school this is a “meander”) around both the Isle of Dogs and the Greenwich Peninsular (future home of the Millennium Dome, now the O2) is very clear from this height. I have added the names of the docks and the location of Greenwich Park where my father and my photos were taken in the following graphic. The West India Docks were opened in 1802 and in total consisted of 54 acres of water. The Millwall Dock was opened in 1868 and consisted of 36 acres of water in the shape of an L (visible in the above photo). The docks further east in the photo (Victoria, Albert and George V) were the last to be built in London and were the largest area of enclosed dock water in the world. The Victoria was opened in 1855, the Royal Albert in 1880 and the George V dock was opened in 1921, its’ construction having been delayed by the 1st World War. The soil excavated from the Victoria dock was used to complete the construction of Battersea Park, which until then had been partly marsh land. The Regents Canal Dock is at the end of the Regents Canal were it enters the Thames at Limehouse. The canal connects the Grand Junction Canal at Paddington with the Thames. The canal was opened in 1820 with the dock constructed soon after. The Greenland Dock is almost all that remains of the Surrey Commercial Docks that once covered most of the peninsular. The core of these docks was started in 1697 and with various developments lasted until 1970. The complex of office blocks in Canary Wharf which now dominate the view from Greenwich Park have been built across the area that was occupied by the West India and South Docks. Parts of these docks remain but are now confined within an ever growing number of very tall office blocks. 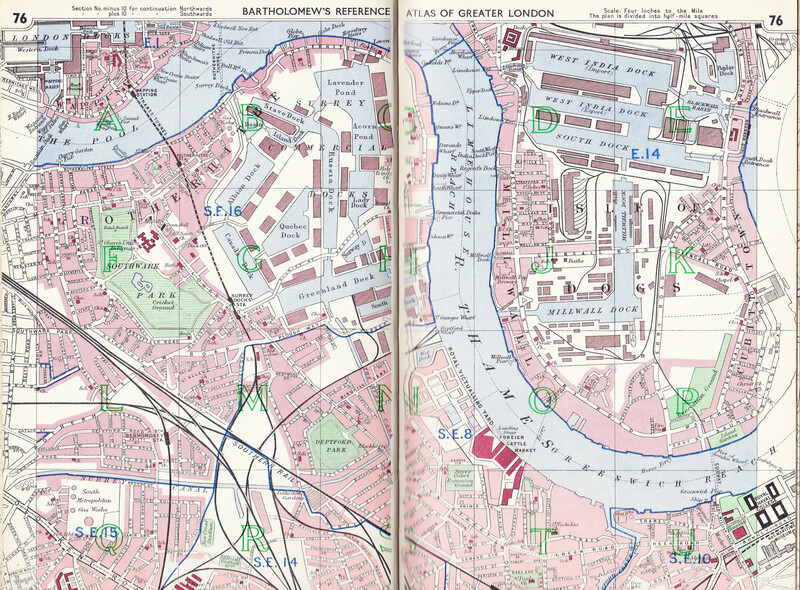 The following map is from the 1940 edition of Bartholomew’s Reference Atlas of Greater London and shows this area of dockland in detail. 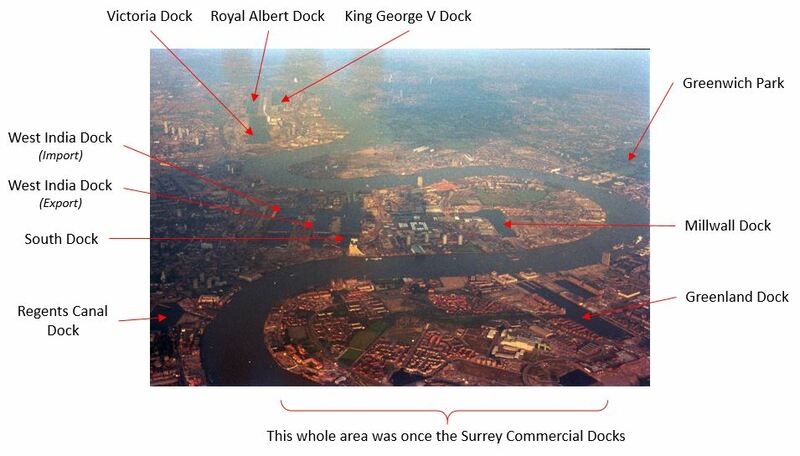 Compare the significant number of docks that made up the Surrey Commercial Docks on the left page with the 1980s photo. These have almost all disappeared. The reference to “its island area has been halved” is to the area occupied by the docks which as can be seen from the map occupy a significant percentage of the Isle of Dogs. The closure of the docks from the end of the 1960s to the 1970s resulted in the loss of a culture, often unique to a specific set of docks, and a chain of related industries that had made this part of London a major trading and industrial community. It would take until the mid 1980s for any form of redevelopment to start across the acres of derelict land left after the closure of the docks, the results of which can now be seen from Greenwich Park. Quite what the residents of the “small streets of Millwall and Cubitt Town” would have thought of the Canary Wharf development and the financial services industries that have now replaced the docks would be interesting to know. This entry was posted in London Vistas, The Thames and tagged Greenwich Park, Isle of Dogs on April 12, 2014 by admin. Wonderfully informative blog with beautifully marked photos and maps — I’m so glad Spitalfields sent me your way. I look forward to reading more in the future. Thank you for blogging. Looking at the photo of the isle of dogs I think this must on or after 1988. The Cascade tower (the triangle shaped tallblock sloping to the south) on the western side of the Isle of Dog, foreground in the picture, is visible and it was not completed until 1988. Also the Surrey Quays shopping centre is visible too and that was opened in 1988. Still a a great picture to look at. I’m not sure I can see Cascades there – but I can see what looks like the Millwall Granary which was demolished around 1970. I am having a lot of trouble with East Greenwich – buildings I don’t recognise and no sign of any gasholders.